In the 1870s (in two campaigns in 1871-73 and 1878-79), the German archaeologist Heinrich Schliemann excavated a hill, called Hissarlik by the Turks, near the town of Chanak in north-western Anatolia. Here he discovered the ruins of a series of ancient cities, dating from the Bronze Age to the Roman period. Situated in the north-western corner of Anatolia, close to the Dardanelles, Schliemann realised he had found the city of Troy. The events described in Homer's Iliad, even if based on historical events that preceded its composition by some 350 years, will never be completely identifiable with historical or archaeological facts, even if the city called Troy was destroyed by fire or war at about the same time as the period postulated for the Trojan War. No text or artefact has been found on site itself which clearly identifies it, although Bronze Age cities in north-western Turkey are rare. The same is mostly true of Troy's allies during the Trojan War - minor states or tribal groupings which may have seemed important in the context of this war, but which were wholly insignificant and probably short-lived in overall terms. In the 1920s the Swiss scholar Emil Forrer claimed that place names found in Hittite texts - Wilusa and Taruisa - should be identified with Ilium (or Ilios - the city of Troy) and Troia (the Troad) respectively. Wilusa and Illium do stem from the same root, so it is entirely possibly to link them on this basis. He further noted that the name of Alaksandu, king of Wilusa, mentioned in one of the Hittite texts, is quite similar to the name of Prince Alexandros (Paris of Troy). Wilusa has also been linked to Ahhiyawa, a (possibly) Mycenaean Greek area of settlement which was located further south in Anatolia, but the state was more probably the most remote of Arzawan lands, lying on the coast, as mentioned by the Hittites. The Arzawan link could mean that Troy likewise was a Luwian-speaking colony. An inscription in Indo-European Luwian has been found in the Troy VI remains, but assigning Luwian as the state's language is still perhaps a step too far without further evidence. Troy first appears as a settlement and each subsequent rebuilding of the settlement leaves an archaeological layer. The first four layers are built and subsequently abandoned or destroyed by the twentieth century BC. Troy I is relatively basic - mud brick houses and a rubblework wall have been discovered from it. The settlement has been founded by very recently-arrived proto-Anatolians, close relatives of their fellow migrants in Anatolia, the Luwians, Hittites, and Pala, all of whom are slightly less closely related to the proto-Indo-Europeans of the Pontic-Caspian steppe. The ancestors of the proto-Anatolians may first have demonstrated their migratory skills as part of the Suvorovo culture of a millennium previously. Troy II shows the same signs of trade with Sumer and increasingly sophisticated artwork that characterises the Hatti during the same period between 2500-2200 BC. This is the 'burnt city' layer with extended towered walls and royal treasure. Troy III is dominated by stone houses. It is sacked and burned in around the mid-twenty-first century BC. Troy IV is rebuilt from the ashes with a citadel that covers four acres and mud-brick houses which feature domed ovens. The cause of destruction for this layer is unknown. The houses in Troy V are larger than before and evidence from the site suggests a greater sophistication in pottery production methods. This layer is contemporaneous with the Hatti city states in central Anatolia and that of Zalpa to the north. The region is probably also settled by Luwians from Arzawa by this time. Troy VI is in use. According to tradition, the state of Troy is built up in this period by the Teucri and Dardanians (although the later use of 'Teucrian' to refer to Trojans is mistaken). The state grows to control the Dardanelles, the north-western corner of Anatolia, and areas in the Balkans. A Luwian inscription found here is dated to this period, but whether or not the Trojans themselves are Luwian-speakers is uncertain. Traditional rulers are shown here in green alongside historical counterparts. Later Greeks date the Trojan War as follows: Eratosthenes to 1184/83 BC, the Parian Marble to 1209/08 BC, Herodotus to about 1250 BC, and Douris to 1334/03 BC. Herodotus' dates have been adjusted downwards by eighty-seven years to bring them into line with the timeframe used here for the Trojan War. The Hittites claim in their later treaty with Alaksandu of Wilusa that ties of friendship between the two states date from this period, under the reign of Hattusili I. Troy VIh subdivision layer is in use. If Troy is indeed Wilusa, then it is this city which borders Mira, a division of Arzawa to the south-east. In the period between 1380-1370 BC, when the Hittite king Tudhaliya IV (III) invades Arzawa, he does not enter Wilusa because the state is a member of the Assuwa (or Assua), a confederacy of local minor states (probably including the states of the Troad) which has traditionally been allied to the Hittites. This word, Assuwa, is claimed as the original form of 'Asia' as used by the ancient Greeks to denote Anatolia. Also ruler of the Dardanians. Tros leaves Troy to one of his sons, Ilos (who marries Eurydice), while the other, Assaracus, rules Dardania. Ilos is credited with founding the royal line of Ilium (or Ilios, which equates to the Hittite (W)ilios / Wilusa). Ally of Hittite King Suppiluliuma I. Murdered. Son. Source of the Hittite name of Wilusa or a construct? Troy VIIa is in use following an earthquake which destroys the VIh city. This is the most likely candidate for Homer's large city which is sacked at the end of the Trojan War, and is also believed to correspond with the Hittite Wilusa of roughly 1330-1245 BC. It is mainly a rebuilding of elements from the previous layer and the city shows signs of rationing, but may recover and expand from this. 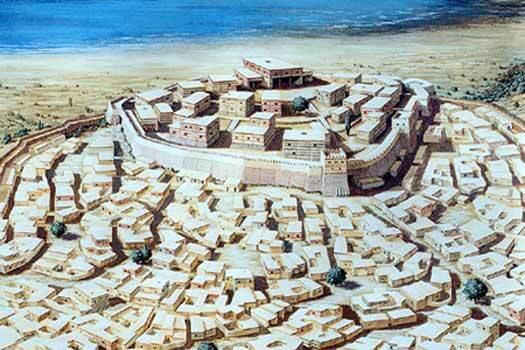 Using Classical dating, the city walls are constructed (by Poseidon, Apollo, and Aeacus) in 1282 BC (this could be rebuilding work undertaken by Alaksandu). A king of Arzawa? Fled to Ahhiyawa? Same as Priam? Piyamaradu is a renegade (or adventurer) who seizes the throne in Wilusa after slaying the king, possibly launching his bid from Arzawa. According to Hittite texts he has the help of Ahhiyawa. He is mention in about 1295 BC and 1250 BC, and in the past tense in about 1245 BC. It may be that he seizes Wilusa in about 1295 BC, is overthrown by the Hittites and replaced by Alaksandu (who himself is not necessarily a blood relative of Kikunni's), and ends up in Miletus where he is aided by the brother of the king of Ahhiyawa. Despite his name being similar to that of the Priam of Greek legend, his career sounds very different, so the link between the two that some scholars favour seems doubtful. There is also a possibility that the real Trojan War is this fight between the Hittites and Piyama-Radu. Homer's build-up to the fall of Troy includes various events in western Anatolia which could also be attributed to a Hittite campaign. The timeframe for this theory fits better with Piyama-Radu being Priam, and his being succeeded by Alexander (Paris). The arrival of Mycenaeans on the coast could be a confusion with later migrations (after 1200 BC) which perhaps have to fight coastal Anatolians to be able to secure a foothold. Later generations possibly merge the two events before Homer's treatment of them. Ally of Hittite King Muwatalli II. Same as Paris Alexandros? At Mira in Arzawa, Kupanta-Kurunta, the adopted son of the Hittite King Muwatalli's aunt, is considered to be a Hittite family member so Alexandros is duty-bound to help Kupanta-Kurunta even against his own people if need be. The Arzawan state of Masa (on the south-eastern border of Wilusa's territory) attacks Alexandros and is destroyed (again) by Muwatalli who already has a treaty agreement with Aleksandu. Restored by the Hittite King Muwatalli II or Tudhaliya V (IV). Son. Dau m Cygnus of Kolonae. Otreus, son of Daskylos, king of Mysia, is killed by Amykos, king of Bithynia, whilst travelling to Troy to sue for the hand in marriage of King Laomedon's daughter, Hesione. The Mysians would appear to be recent arrivals in the region, and are no doubt attempting to cement their position. Laomedon is claimed by Greek literature to be the father of Tithonus, who himself is later a lover of Eos, goddess of the dawn. Eos bears Tithonus two sons, Memnon and Emathion, while Tithonus is claimed to be the founder of Susa after travelling east into [through] Assyria. In fact, Susa is already an ancient city of Elam. Memnon, 'son of [the] dawn', apparently forms an overseas colony, claimed to be Ethiopia but more probably much closer to Troy, who brings his forces to Troy's assistance during the Trojan War. Wilusa's traditional ally, the Hittites, are destroyed around this time, as are the Arzawan lands to the south-east, and general instability grips the Eastern Mediterranean coast. The state probably finds itself very much alone in this period, with just its local allies for support. Son of Priam. Mortally wounded by Philoctetes. Agamemnon of Mycenae amasses the forces of his allied Achaean kingdoms and sails from Greece, determined to attack Troy. In response, Troy gathers its own allies together, including those of Dardania, the Halizones, the Hyrtacidae, Karkissa, Kolonae, Larissa, Lycia, Lyrnessos, Maeonia, Mysia, Paphlagonia, Percote, Phrygia, Thrace, and Zeleia, along with Pelasgians from several locations in western Anatolia. They are led by Hector and Paris of Troy. The allied contingents speak a multitude of languages, so orders have to be translated by each contingent's commander. In the Iliad, the Achaeans beach their ships in the final year of the conflict and set up camp near the mouth of the River Scamander (modern Karamenderes, five kilometres further inland than today, pouring into a bay). The city of Troy itself stands on a hill, across the plain of Scamander, which is where the battles of the Trojan War take place. After fighting to a stalemate, the Mycenaeans finally enter and sack Troy. The son of Achilles of Phthia kills Priam and takes Andromache, the widow of Hector, as his concubine. He also takes Elenos, a son of Priam, as a slave when he travels to northern Greece to found the kingdom of Epirus. Chaon, brother or friend of Elenos, goes with them. The rest of the invaders also carry off slaves and booty. On the Trojan side, Aeneas manages to escape the destruction and with his Dardanian followers eventually settles in Latium, while the Elymi of Sicily are also claimed as Trojans. The single, ten year war is probably Homer's collecting together of an ongoing conflict, as at one point a Hittite letter to a Mycenaean king briefly waves aside the Wilusa 'problem' and states that the two kings are friends again. Later Greek myths (from the sixth century) say that Helen spends the duration of the Trojan War in Egypt rather than Troy, and that after the war the Mycenaeans go there to recover her and are identified by the Egyptians as Sea Peoples. Son of Priam. m Helen but killed by Menelaus. Troy VIIb1 is in use as a smaller settlement is rebuilt out of the ruins, probably by a mixture of surviving natives and Mycenaean settlers. Mycenaeans have already been settled near, and in, Troy since before the Trojan War (probably traders for the most part), as evidenced by the Greek cemetery uncovered at Troy by archaeologists in the twentieth century. This Troy is destroyed by fire. Troy VIIb2 is in use and is apparently destroyed by fire. Troy VIIb3 is in use but is deserted by around 950 BC, with the site remaining uninhabited for about two centuries. Troy VIII is in use but is again abandoned, remaining uninhabited during the Classical period. Hellenistic Troy IX is founded by Rome and remains an important trading city until Constantine establishes his new city of Constantinople. 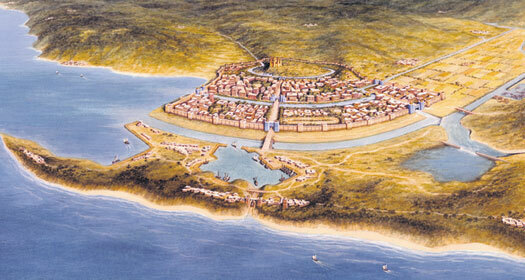 Under Byzantine rule the city gradually declines and eventually disappears.